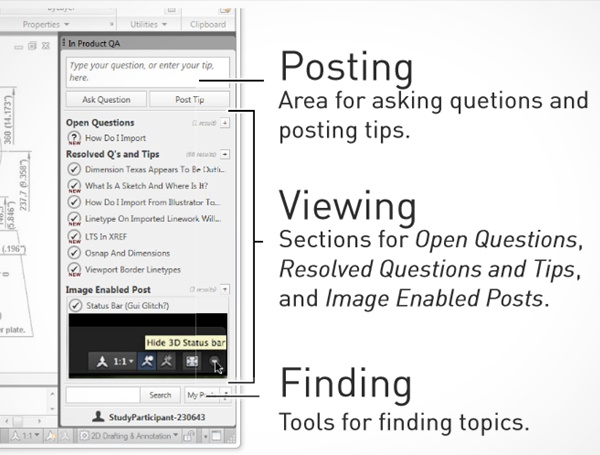 We present IP-QAT, a new community-based question and answer system for software users. Unlike most community forums, IP-QAT is integrated into the actual software application, allowing users to easily post questions, answers and tips without having to leave the application. Our in-product implementation is context-aware and shows relevant posts based on a user’s recent activity. It is also designed with minimal transaction costs to encourage users to easily post, include annotated images and file attachments, as well as tag their posts with relevant UI components. We describe a robust cloud-based system implementation, which allowed us to release IP-QAT to 37 users for a 2 week field study. Our study showed that IPQAT increased user contributions, and subjectively, users found our system more useful and easier to use, in comparison to the existing commercial discussion board.